“This is an area where we have massive coal mines left abandoned,” says Sabraw. John Sabraw grew up making time machines from toasters and old alarm clocks. He built a helicopter from fence pickets and broom handles for liftoff from the military base where he spent his childhood. Whatever he could lay his hands on Sabraw would turn into craft and sculpture. These days he brings that same principle of salvage and innovation to his work as a professional artist. Inspired by science and the natural world, his goal is to produce artwork using sustainable materials and methods. That goal is made easier by his collegiate surroundings. Partnering with Ohio University engineer Dr. Guy Riefler, they developed an entirely new type of paint made of the runoff from Ohio’s old coal mines. “This is an area where we have massive coal mines left abandoned,” says Sabraw. Riefler and Sabraw found a way to extract those metals from the streams and put them to work as pigments. Iron ore (ferrous oxide) is the basis of commercial red and yellow paints, but according to Sabraw a lot of it comes from China. 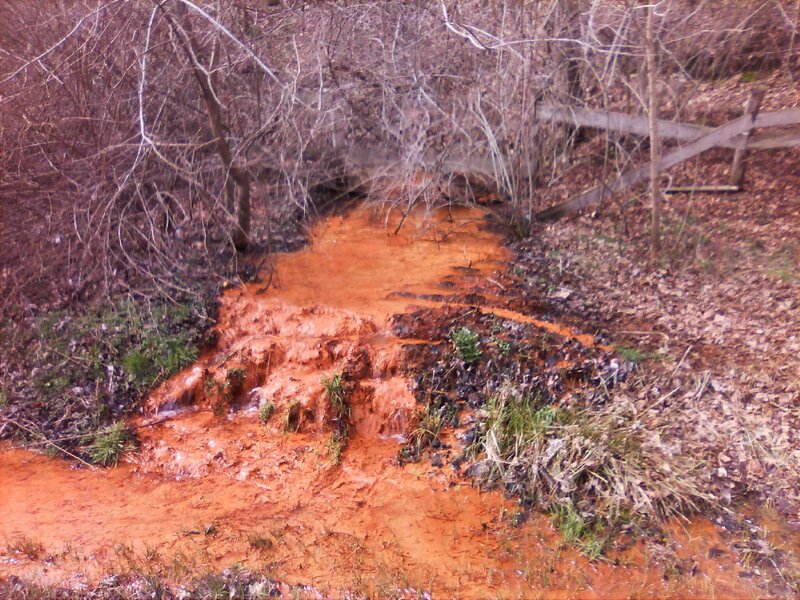 “They take rusted old metals and put them in giant tanks and use chemicals to get it to do what our streams are doing naturally here,” he says. Using a heavy glass mortar, Sabraw demonstrates how he blends the pigments with oil to create a rich mahogany hue. “You can get a range of shades. It can go anywhere from a super-deep brown, something like 80 percent dark chocolate, all the way up to something that’s going to look like a terra-cotta tile,” he says. Sabraw’s ultimate goal is to commercialize the paint and put the profits toward the cleanup of runoff-damaged Ohio streams. 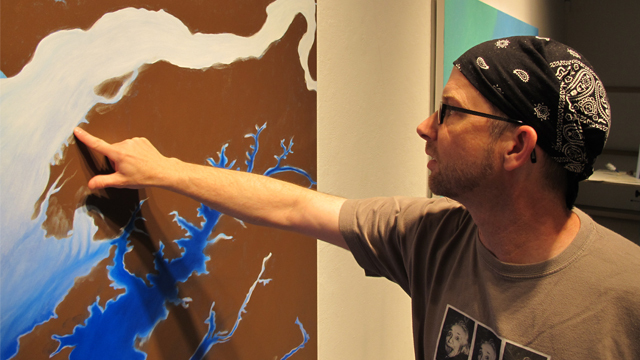 Artist John Sabraw checks the paint on one of his works in progress. 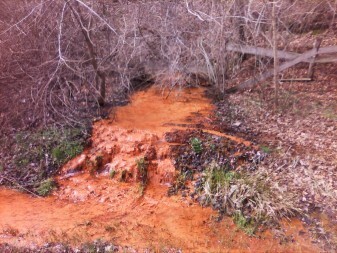 The brown pigment is sourced from coal mine runoff. Paint: Sabraw uses water and linseed-oil-based paints, carefully sourced pigments, and low-VOC, reusable solvents to clean his brushes. Canvas: Instead of canvas, Sabraw paints on linen, recycled wood, and scrap aluminum from old commercial signage. Delivery: All his shipping crates are reusable. Foam and other packing materials are also reused. Studio: Sabraw wakes up early to beat the summer heat. His southern Ohio studio isn’t air-conditioned. He relies on natural and CFL lighting. When he leaves the studio, it is by bike. Carbon Credits: All of Sabraw’s works are carbon neutral because he purchases carbon offset credits. He even developed an algorithm for artists to determine their carbon footprint. Classroom: Sabraw is a teacher at Ohio University, where he asks students to consider ideas of sustainability within their craft. He started a website called Green World Art to spark and share best practices within the artist community. And he doesn’t stop at adults. He’s helping build sustainability into the curriculum of the New York-based Scribble Art Workshop, a kids’ art program created by one of his former students. Beautiful artwork and a wonderful idea to get these heavy metals out of our environmental. But aren’t some of them toxic especially to children who may use them? This is so amazing!!!! Such beautiful art from such destructive iron run off!! !